I’ve been thinking about flavor. 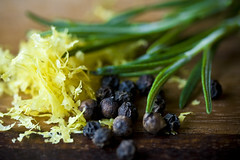 More specifically, how to get the most flavor out of each ingredient used in a recipe. This is especially important when you want to make a meal and only have a few things on hand. If you can make each ingredient really count, it doesn’t matter if your only throwing a handful of them together. The recipe I’m going to use as an example of making your ingredients count is a simple minestrone. Before I made the soup I asked myself, “So what technically makes a minestrone?” The answer turned out to be “Almost whatever you want”–which makes it the perfect soup to make when you find your fridge a little more bare than you’d prefer. Minestrone started as the classic “garbage soup.” I prefer to call it these kinds of soups “clean out the fridge soups” myself. The idea is that you do not go grocery shopping to make minestrone. You use whatever you have on hand, be it extra vegetables, canned goods, frozen things, or leftovers. So how did I get the most out of the ingredients I had? The extra time put into caramelized onions really pays off. The longer you cook them, the more complex their flavor becomes. I saute my onions for at least 10 minutes in olive oil, until they are a lovely reddish-brown and very soft. It is SO worth the extra few minutes of cooking before you proceed with your meal. Spend the 10 minutes prepping your other veggies to make the rest of the meal go smoothly and quickly. Keep a stock of canned tomatoes, if you don’t already. If you buy stewed or fire roasted tomatoes, you already have a leg up. These tomatoes are already partially cooked and have a lot of flavor in a convenient package. Unless it’s mid-summer and I have gorgeous vine-ripened tomatoes, I always go for the canned stuff. It’s easy, cheap, consistent, and tasty. At the risk of sounding like Rachel Ray, it really does help you get “all day flavor” in just a few minutes. I rarely have fresh herbs available (they’re expensive and I’ve failed at growing my own), but when I do, I try to get the most out of them. Don’t add fresh herbs until the very end of cooking. The delicate flavors will be most enjoyable if you toss your freshly chopped herbs in at the end of whatever you’re making. The residual heat from the dish is enough to carry the flavors through. This applies to pepper, too. Try out fresh cracked pepper, from whole peppercorns, added at the end over your dish. You’ll be astounded at the difference in flavor compared to pre-ground pepper. How many dishes do you make that start with a bit of oil heated in the pan? If you’re using dried herbs or other spices, try throwing them in at the very beginning, in the oil. Tossing dried herbs and spices into oil and sauteing for a minute or so (longer with whole spices) flavors the oil itself and brings a whole new dimension to your cooking. The majority of Indian dishes start this way, and for good reason. I admit that I’m a bit of a salt whore. I love it. But it really is amazing stuff. It doesn’t just make things salty, it actually enhances other flavors. I can taste all the other flavors in my dish much better when it is sufficiently salty. Even pasta cooked in salted water tastes better to me. I also use vinegar in conjunction with salt. I use the term vinegar loosely to mean nearly anything that’s sour. I keep balsamic vinegar, white wine vinegar, rice vinegar and apple cider vinegar on hand at all times, but lemon juice works great on it’s own in many occasions. Vinegar can be a lifesaver if you over-salt something by accident, but I like to use salt and vinegar together to really punch up a dish’s flavor. They’re a great team. If your dish needs a little “something” and you don’t know what that is, try salt and/or vinegar and see where that gets you. I think it’s easiest to balance the flavors if you add the salt before the vinegar. Add a few tablespoons of olive oil in the bottom of a soup pot that has a lid. Heat oil and add onions. Cook over medium heat, stirring occasionally, for 10 minutes. In the last minute of cooking, add the garlic. Tip for mincing garlic: After removing the skin (smash it lightly with the flat side of your knife to do that), chop the garlic with a pinch of salt. The salt acts as a tenderizer and the friction of the granules break down the clove to help you achieve a fine mince. Add the tomatos to the onions and garlic and simmer for another 4-5 minutes. Add the carrot and the water/broth and bring to a boil. Add the tomato paste, bay leaf, and celery salt cook until the carrots begin to soften. Then add macaroni and stir often, making sure it doesn’t stick to the bottom of the pan. Add kale. Add salt to taste. I used water, and therefore added 1 1/2 tsp of salt. If you used vegetable broth or bullion, you may not need this much salt. Simmer, covered, until the pasta is cooked. Add the peas at the end, they’ll defrost in a matter of seconds. Turn off heat, add fresh herbs. 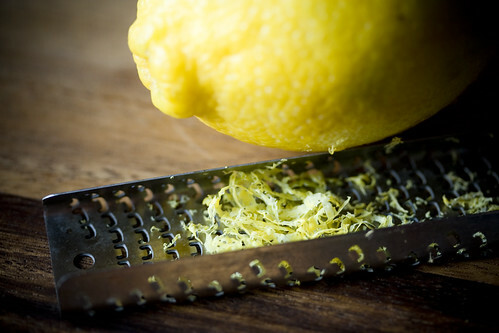 Ladle soup into bowls and grate some lemon zest over the top of each serving. Sprinkle pepper over the top. This is a beautiful post. Caramelized onions are to die for! I’m really wanting soup for dinner now. Do you use tomato paste in a tube so that you can just take out one tablespoon? Aren’t Microplane graters/zesters the best? I line an empty ice cube try with plastic wrap, scoop out 1 Tbs of paste into each hole, and cover it with another sheet of plastic wrap. Once it’s frozen, the tomato paste cubes come out of the tray easily. I pull the plastic off and pop the cubes in a freezer bag. It’s a little more of a time investment when I first open a can, but it’s been great to pull 1 Tbs chunks out of the freezer as I need them! Marina – Thanks for the herb tip! Brilliant! Caramelized onions do make a world of difference…roasting red pepper always helps me out too. Hi there, I recently discovered your blog and I really enjoy it. The photos are brilliant! That would totally hit the spot in this weather. 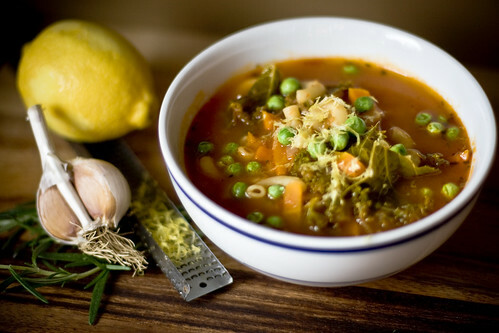 minestrone is by far one of my all-time favorite soups – your recipe and ingredient-choices are phenomenal! I tried this last night. DELICIOUS!!!!! It was the perfect soup and will certainly become a staple in my house. After trying fire-roasted tomatoes, I don’t think I’ll ever turn back to the plain ol’ canned diced tomatoes. I didn’t have any bay leaves, so I threw in a couple sprigs of fresh thyme. Thank you for such a great vegan blog! oh we’re so twins! i loooove salt i put it on anything… i love saltines as a snack i love just salted mini bagels… there is nothing better then a salted mini bagel and hot soup in the winter… my theory is almost anything’s edible with enough salt and tomato based products… the example here would be minestrone… which is my favorite soup ps… that and chicken enchilada… oddly enough there is no animal products or subs in it… it’s accidentally vegan… this sounds sooo good if i wasn’t bedridden and sick i would so make it! thank you SO much for sharing all these wonderful ideas. I happened upon you by Googling ‘how to put rosemary in soup’ – you’ve given me super inspiration to make my veggies more flavorful. Hello! I just found your blog from the link on the FoodieView Recipe Roundup. Great post. The combination of flavors in this soup sounds wonderful. I love the idea of using fire roasted tomatoes. hat would totally hit the spot in this weather.